The San Diego High Intensity Team in Training riders are looking great here at the top of the mountain!! A big congratulations to Dan Thomas of Veloce Santiago who set a new Course Record in the blazing time of 5:12!! Dan's awesome ride beat the prior Course Record of 5:16 set by Marc Patton in 2000. Dan was flying up the mountain so fast that the volunteers had a hard time staying in front of him. 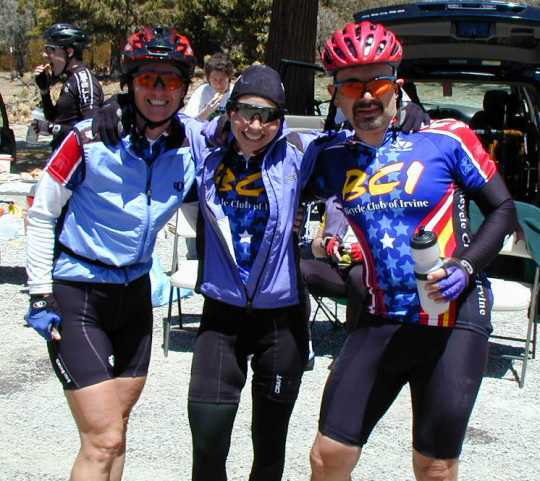 Many riders from the Bicycle Club of Irvine came out on the 2003 Breathless Agony!! 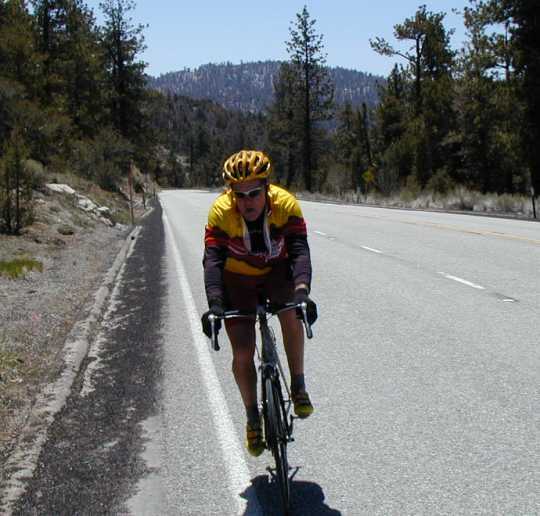 The top 3 Women who completed all 4 Passes were from the Bicycle Club of Irvine ... this is a huge achievement for 3 riders from any bike club indeed!! A BIG Congratulations go to Colleen Montoya, Vicki Chernoff, and Marissa Hindman and the entire Bicycle Club of Irvine!! It was great fun to share the joy of these cyclists arrving at THE TOP!! These photos show how great of a time it was at the Onyx Summit Party this year!! The weather was perfect with clear blue skies and 48 degrees on the climb up to Onyx Summit at 12 Noon. Perfect for climbing for sure!! What a difference a week makes ... the prior Saturday it was snowing and raining up there!! Congratulations also goes to Barclay Brown from San Diego who became the First Person Ever to Complete ALL 4 Passes of the Breathless Agony on a Recumbent Bike!! This is a great achievement because recumbents are more difficult to ride on long climbs ... but Barclay makes it look so easy. Congratulations Barclay!! Roving SAG: Pete & Shelly Smith did a great job roving the course all day. This course is brutal on bike drivetrains with the shifting under load going up some of the steep gradients. Pete & Shelly helped a bunch of riders with flat tires and at least one rider with a drivetrain lock up problem. Thanks Pete & Shelly for driving up and down Oak Glen, Damnation Alley, Barton Flats, and up to Onyx Summit over and over again all day!! Start: Peggy Sue Phillips and Livia Peraza did the Day of Event Sign Ups and handed out the rider bags containing everyone's socks, water bottle, and route sheet. Thanks to Marty Breen for bringing a full van load of supplies out in his van from the night before. Rest Stop 1 at Beaumont: Peggy Sue Phillips, Livia Peraza, and Marion Pineda did a great job getting everything set up quickly in Beaumont. The riders arrived at this first Rest Stop in large groups so it took a lot of fast teamwork to make it all happen. Thanks Peggy Sue, Liv, and Marion!! Rest Stop 2 at Ranger Station: Dave and Mary Harris really took good care of the riders here. This is a critical rest stop for the cyclists ... they burned a lot of calories getting up and over Oak Glen ... and if they don't fuel up before Damnation Alley, they can't make it to the top. Dave and Mary did a fantastic job with a fully loaded Rest Stop here. Rest Stop 3 at Angelus Oaks: Pat Kapp and Bob Brooks helped set it up ... then Dr. Ron Koons and Bob McSparron took over. This was a world class Rest Stop as well ... PB&J sandwiches artfully displayed in a pyramid fashion on silver trays with a table cloth!! We were in good hands with Dr. Ron nearby in case of medical needs that fortunately no one had to take advantage of. We really appreciate new team mate Bob McSparron helping out here as well. Rest Stop 4 at Onyx Summit: Peggy Sue Phillips, Livia Peraza, and Marion Pineda led the party at Onyx Summit this year and what a great time we had up there. Blue skies. Rock and Roll by The Who. Some Grim Reaper guy running around. Greg Mills rode Pass 1 & 2 then hopped in the van with Livia up to Onyx where he cooked up some Hot Apple Cider that was a big hit. Pat Kapp and Bob Brooks carefully drove the double wide Porta-Potties up the mountain ... then used their Architectural & Engineering skills in setting them up to be perfectly level and so they wouldn't tip under load ... a true work of art!! Speaking of Porta-Potties ... these were the best ever ... complete with hand washing areas on each side!! Everyone who arrived at Onyx Summit completing all 4 Passes received a "I Hammered All 4 Passes of the 2003 Breathless Agony Century" Refrigerator Magnet. It was a joy to be able to award these to the cyclists at 8,443 Feet. There was a whole lot of fun cheering going on up there!! Thanks also to the Caltrans Guys who rebuilt the Onyx Summit sign after it was blown over a couple of weeks before. 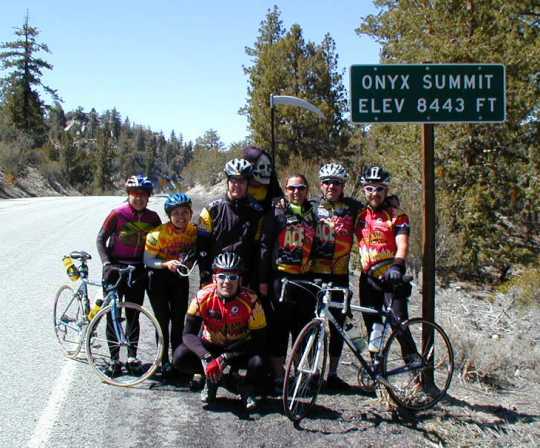 The Onyx Summit sign is a beautiful backdrop for so many of these fun photos. On June 12, 2003, Chuck Bramwell rode the 4 Passes of the Breathless Agony on the Worker's ride. He started at 6:59 and arrived at RS4 at 14:26 for a 7:27. He saw the Grim Reaper near Onyx Summit.